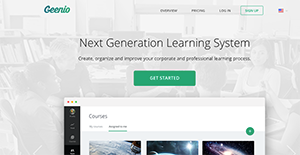 Geenio is a cloud-based learning management system (LMS) that allows users to build, design, and enhance their learning process. This next generation online learning platform enables you to create a full cycle of learning, from the content creation phase all the way through to the final analysis of the learning results. The best part is that you don’t have to use additional tools or acquire new technical skills to fully leverage the power of Geenio. Easy to use and very affordable, Geenio ensures that you create and execute effective learning strategies for professional and corporate settings, analyze results, and create best practices with less effort right off the bat. The system is also optimized for mobile devices, making sure that you are in control over your learning system while your learners have instant access to your content and more anytime, anywhere. Geenio is very user-friendly learning management platform that simplifies the creation and management of full learning process. With its smart course builder, you can create professional looking courses from scratch without programming expertise or instructionals design skills. You can also build interactive and non-linear courses using its drag and drop interface. Do you want to incorporate multimedia elements to your courses? Or attach lessons and tests to your learning materials? Geenio simplifies that and more. You can even import your SCORM courseware to your new course. The Geenio content editor allows you to write stylish content for learning while the system takes care of the rest. Once you entered your content, Geenio automatically does all the routinary work in terms of style, alignment, positioning, and background in compliance to your corporate style guide. Geenio helps you analyze the learning progress of your students with its evaluation tools such as tests. Test results are presented as comprehensive statistics, which makes it easy for you to determine the strengths and weaknesses of your students, identify fast learners, leaders, challengers, and outsiders. This helps you create learning courses that will trigger their learning and enable them to excel in areas where they struggle. Assigning courses to your students is a breeze as you can easily send them to your students via the Geenio interface. You can invite new users to your courses via email integration. What Problems Will Geenio Solve? Easily convert existing PPT and PDF documents that are used for ILT sessions into editable e-learning modules by simply uploading those to Geenio. Add tests, quizzes, surveys and interactive elements to make those documents more efficient and engaging. Built-in course builder that includes non-linear course planning tool, test composer and learning materials editor doesn’t require any special skills or programming experience to produce a high-quality course. Pre-built themes, templates, and course samples make it easy for SMEs without Instructional Designer skills to transform own knowledge into engaging learning modules. A multi-tenant structure allows one account owner to have multiple Geenio sites. Each of these sites can be branded and styled for a separate company and still managed from a central location. It is possible to re-use courses between sites and granularly manage access to control elements for these sites. There are well-liked and widely used applications in each software category. But are they automatically the best fit for your organization’s special needs? A popular software application may have thousands of subscribers, but does it offer what you require? For this reason, do not blindly shell out for popular systems. Read at least a few Geenio reviews and consider the elements that you want in the software such as the price, main features, available integrations etc. Then, shortlist a few apps that fit your requirements. Try out the free trials of these platforms, read online reviews, get information from the vendor, and do your homework thoroughly. This exhaustive homework is sure to help you find the finest software platform for your organization’s unique needs. How Much Does Geenio Cost? We realize that when you make a decision to buy Learning Management System - LMS it’s important not only to see how experts evaluate it in their reviews, but also to find out if the real people and companies that buy it are actually satisfied with the product. That’s why we’ve created our behavior-based Customer Satisfaction Algorithm™ that gathers customer reviews, comments and Geenio reviews across a wide range of social media sites. The data is then presented in an easy to digest form showing how many people had positive and negative experience with Geenio. With that information at hand you should be equipped to make an informed buying decision that you won’t regret. What are Geenio pricing details? What integrations are available for Geenio? If you need more information about Geenio or you simply have a question let us know what you need and we’ll forward your request directly to the vendor.